Do you love Black Friday madness or wish you could make it stop? 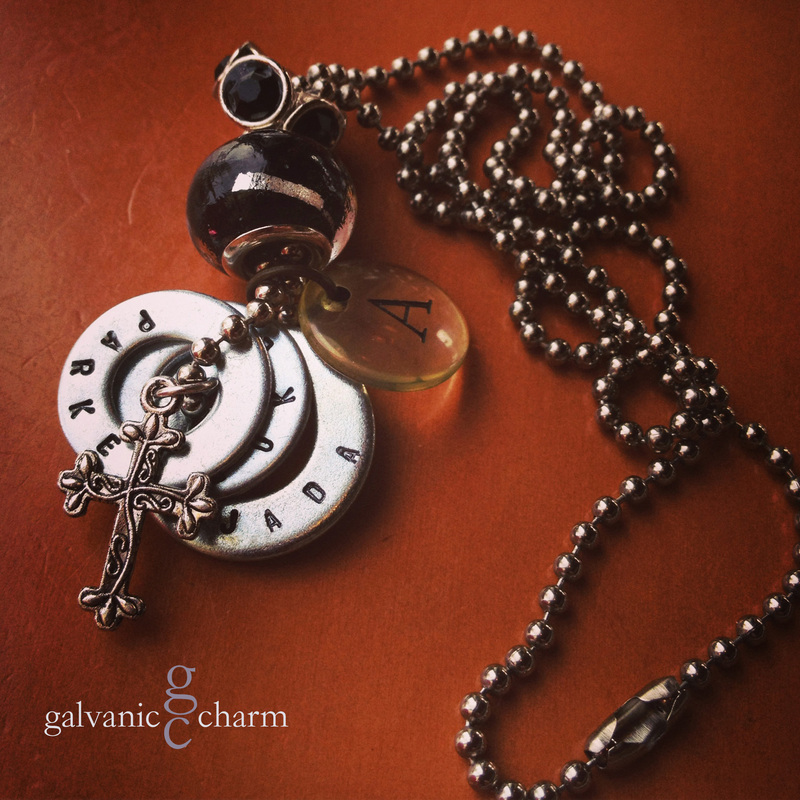 Either way, plan on taking advantage of the Galvanic Charm Thanksgiving weekend sale! Place any order through me between now and Monday and receive 15% off of your purchase! Need some inspiration? I’ve got plenty. 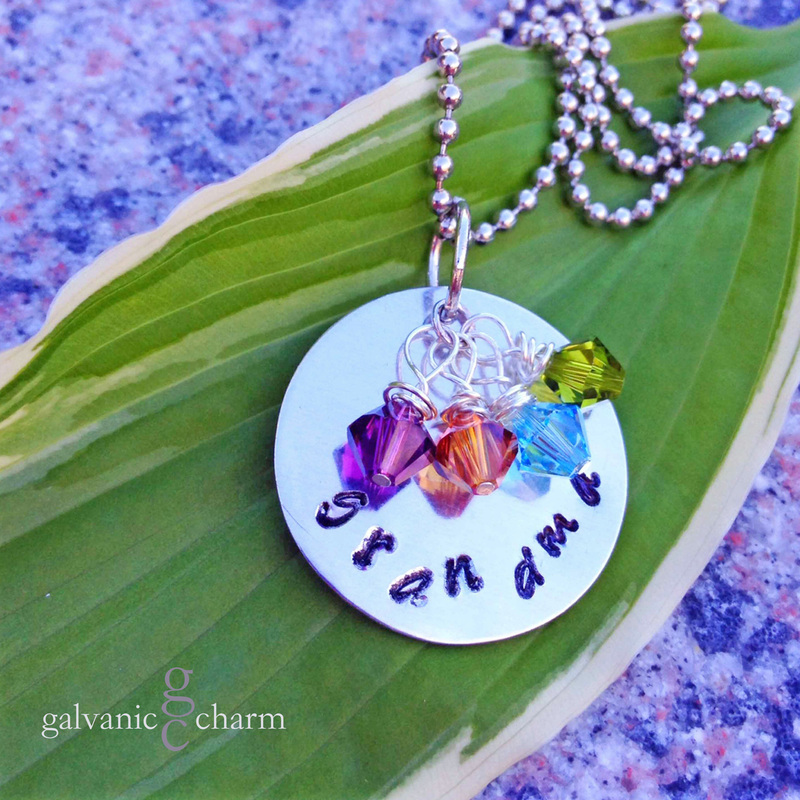 Every grandma is a proud grandma, help her show off her pride and joy with names or birthstones! ABI – Grandma’s necklace with 3 hand-stamped distressed stainless steel tags. Aquamarine, pearl, and peridot birthstone drops, and intricate pewter bead. 18″ stainless steel ball chain. $55 as shown. Available directly or on Etsy. GRANDCRYSTALS – Hand-stamped (grandma) 1″ silver plated solid circle with up to four wire wrapped Swarovski crystal birthstone drops ($5 per each additional drop). 18″ stainless steel ball chain. $40 as shown. Available directly or on Etsy. Have a hard to buy for tween? Figure out what she likes – sports, colors, dance, animals? Then design something she’ll love. Great for birthdays too! 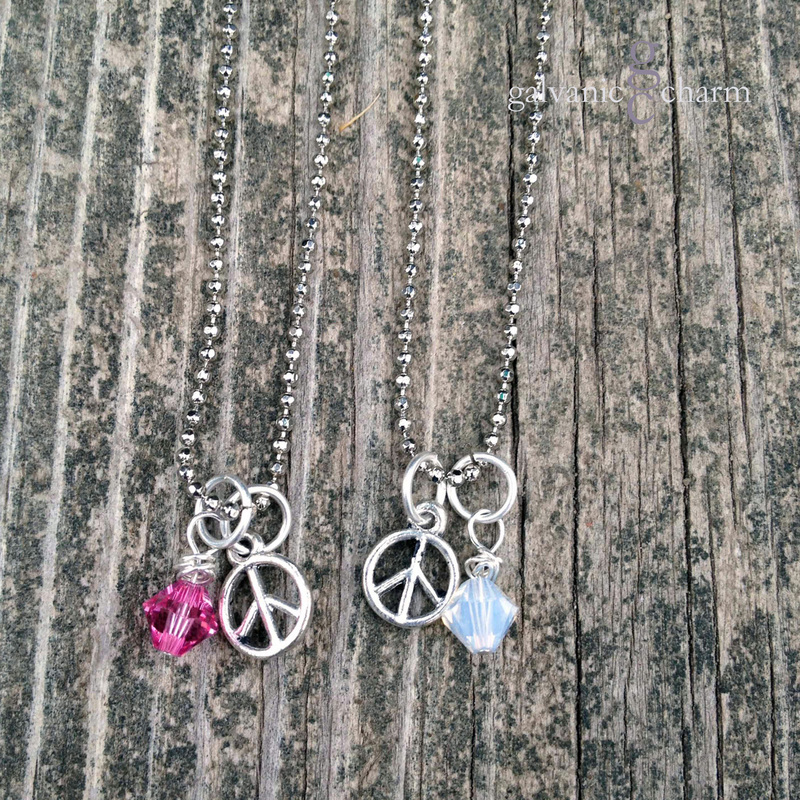 PEACE GIRL – Birthstone necklace with pewter peace sign and wire wrapped Swarovski crystal droplet. 14″ rhodium plated fine ball chain with lobster clasp. $20 as shown. Available directly or on Etsy. 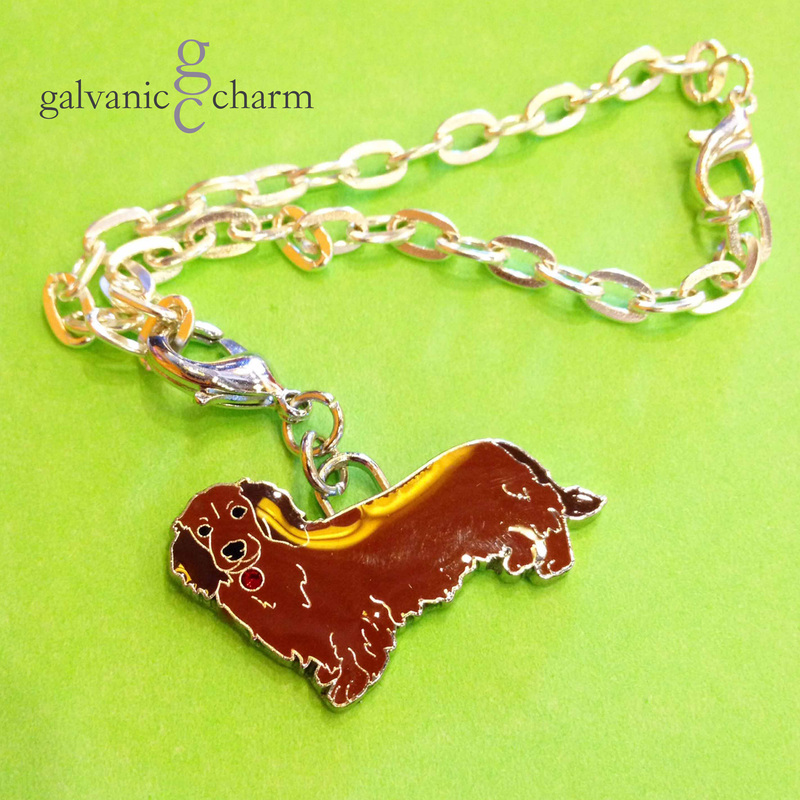 DOXY – Charm bracelet with enamel dachshund charm. 7″ adjustable silver plated cable chain with lobster clasp. $15 as shown. Available directly or on Etsy. 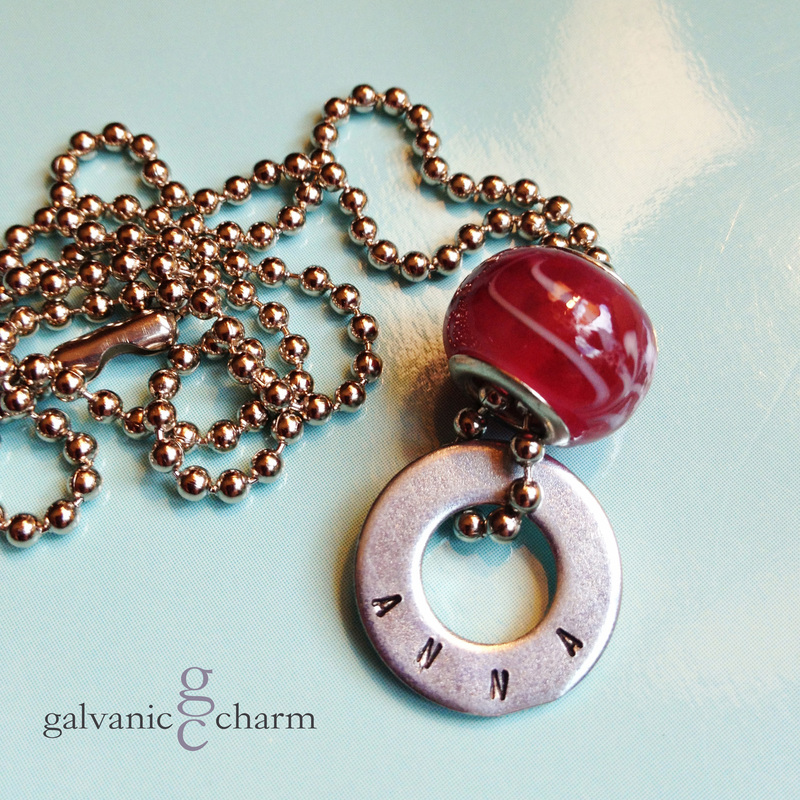 ANNA – Child’s necklace with single hand-stamped washer. Cherry-colored glass bead. 16″ stainless steel ball chain. $22 as shown. Available directly or on Etsy. Or something simpler, like initials or birthstones. LETTERDROP – Initial necklace with hand-stamped 1/4″ German silver disc, and wire wrapped Swarovski crystal birthstone drop. 3cm Bridgette font. 18″ light silver plated cable chain. $20 as shown. Available directly or on Etsy. VINTAGE – Patterned antique brass circle with hand-stamped initial. Shown with wire wrapped aquamarine (March) Swarovski crystal birthstone drop. $22 as shown. Available directly or on Etsy. 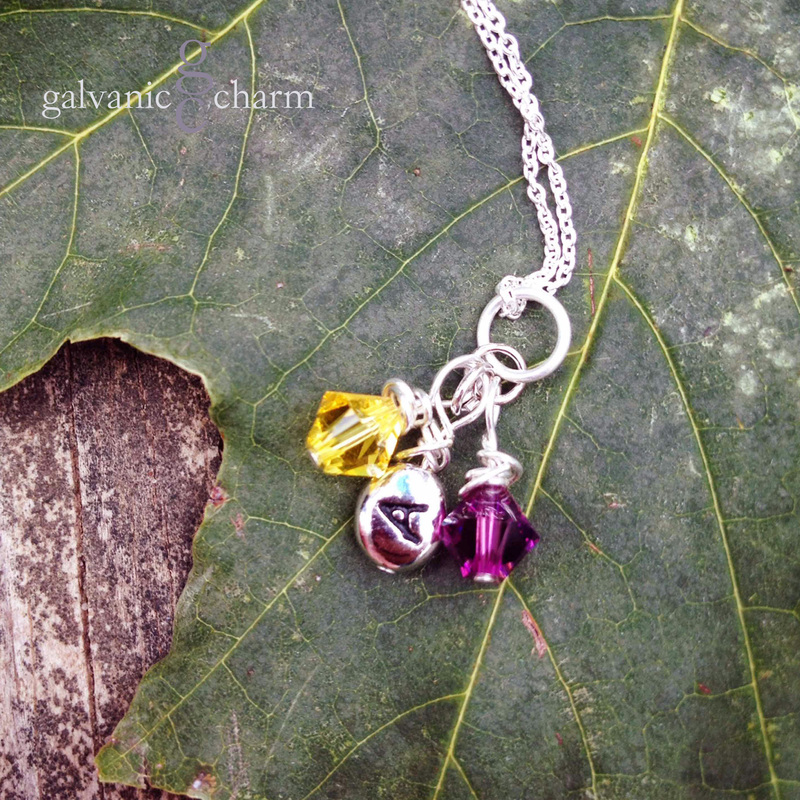 JOINED – Newlywed necklace with sterling silver wire wrapped initial charm with two wire wrapped Swarovski crystal birthstone drops (pictured with amethyst and citrine). 18″ extra-fine silver-plated cable chain. $25 as shown. Available directly or on Etsy. There are also options for causes, awareness, and interests special to anyone’s heart. 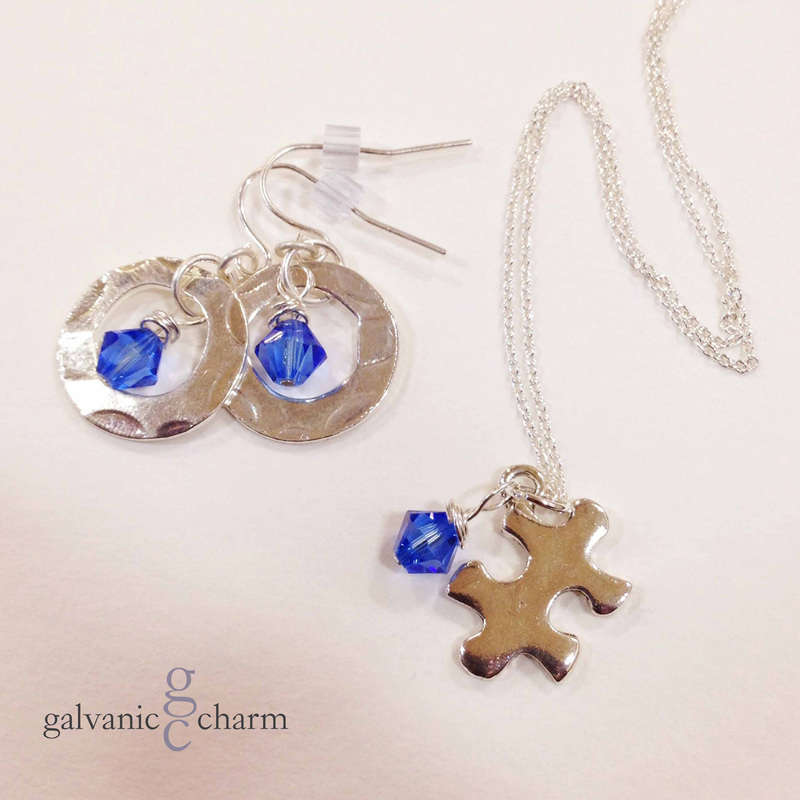 SPECTRUM – Autism awareness necklace with pewter puzzle piece and wire wrapped blue Swarovski crystal drop. 18″ light cable chain. Matching silver wire earrings with textured German silver circles, and wire wrapped blue Swarovski crystal drops. Necklace $20 as shown. Earrings $10 as shown. Or $25 as a set. Available directly or on Etsy. And of course for moms, customize with anything that makes her happy! 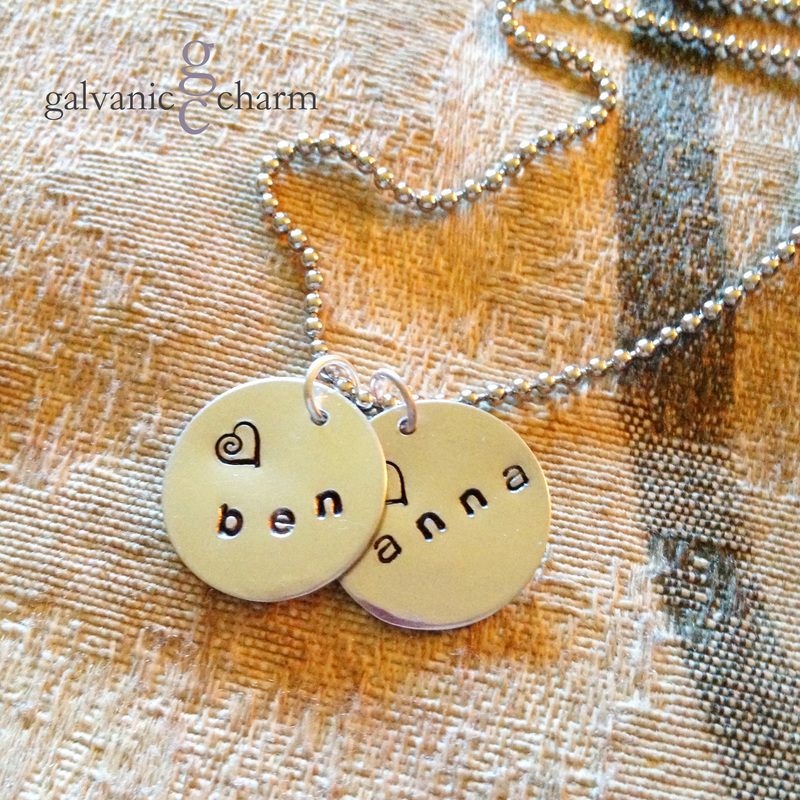 BENANNA – Mother’s necklace with two hand-stamped 1″ soft strike German silver circles. 3mm lowercase Gothic font. Stainless steel ball chain. $25 as shown. Available directly or on Etsy. 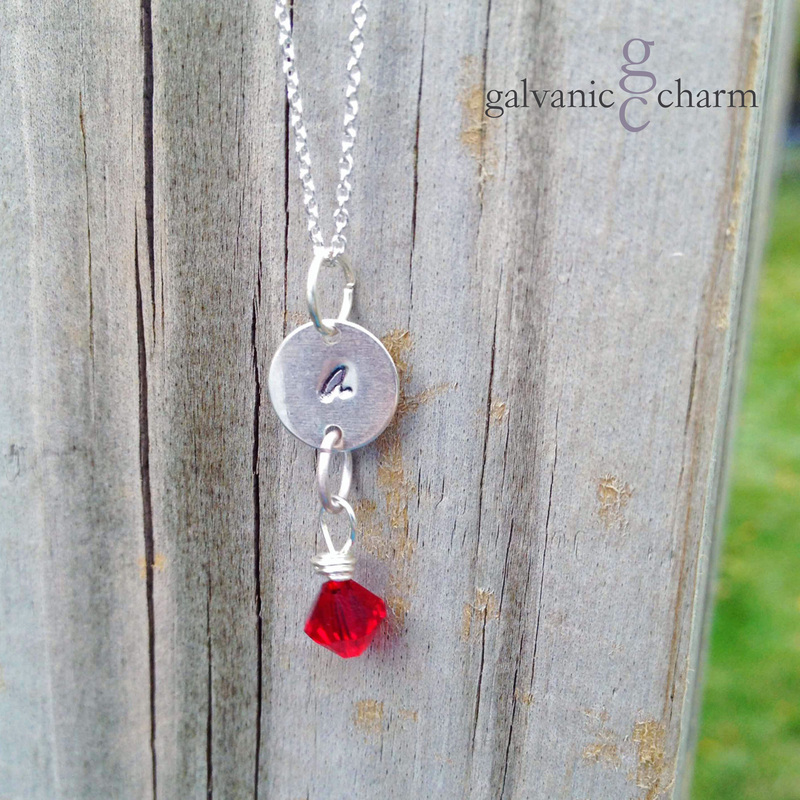 CHARMER – Mother’s necklace with 3 hand-stamped washers. Stainless steel ornate cross, clear acrylic initial disc, black-design glass and black rhinestone beads. 24″ stainless steel ball chain. $45 as shown. Available directly or on Etsy. 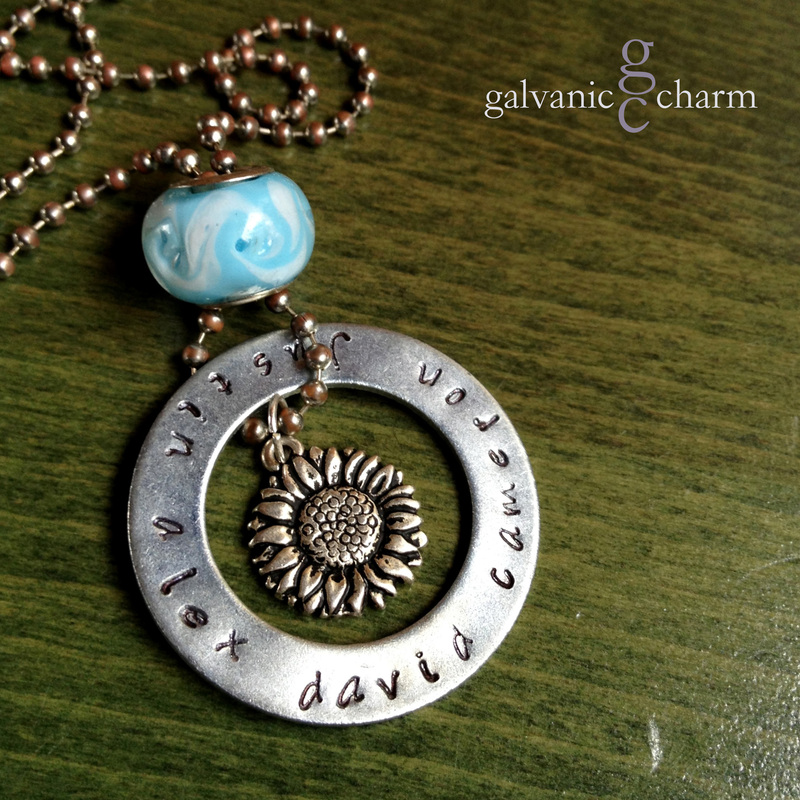 SUNFLOWER – Mother’s necklace with hand-stamped 35mm washer in Bridgette font. 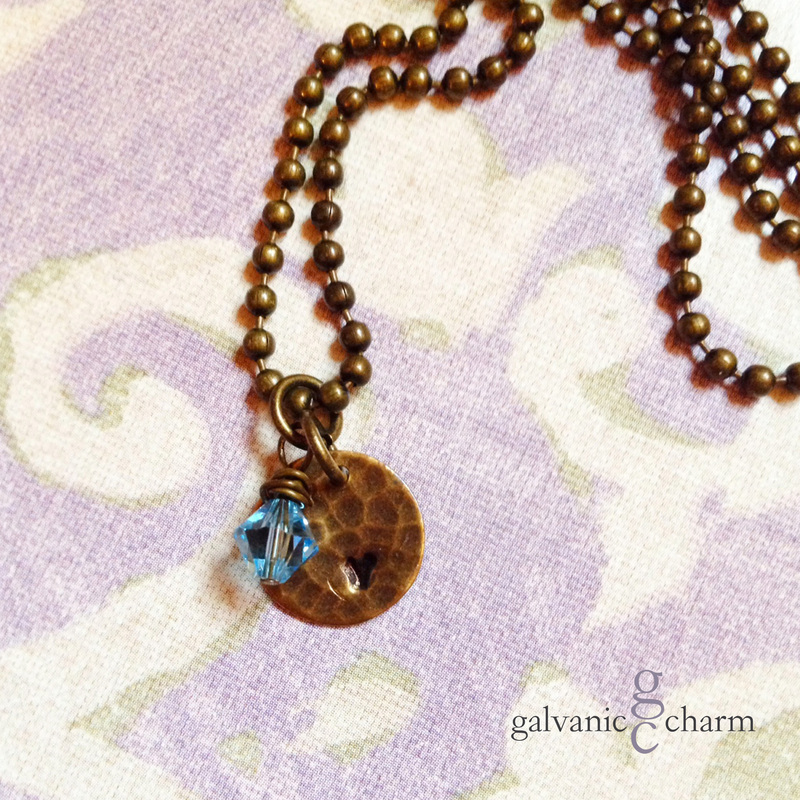 Pewter sunflower charm, sky blue glass bead. 20″ weathered stainless steel ball chain. $45 as shown. Available directly or on Etsy.